Surrounded by beautiful jack pines, and directly along a breathtaking trail, stands Big Sable Point Lighthouse. The lighthouse stands over 100 feet tall. 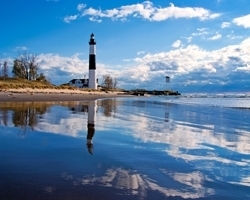 This historic beacon is owned by Ludington State Park. The1867 lighthouse and grounds are operated by SPLKA, (Sable Points Lighthouse Keepers Association) a non-profit which proudly manages three historic lighthouses within a 30 mile stretch of Lake Michigan’s shoreline. SPLKA also operates a Volunteer Keepers program which allows its members the opportunity to live and work within the lighthouses completely free of charge during the seven-month season, May–October. Visitors are always welcome to explore the grounds, tour the original Keeper’s Quarters which have since been converted into a Gift Shop, or stroll along the sand dunes or climb the tower.